"I enjoy the challenge of effectively understanding a client’s technology and business objectives and applying the law to get a good result." 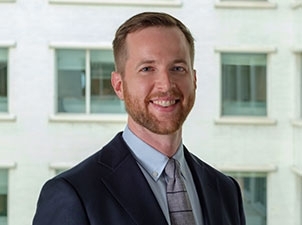 Paul B. Henkelmann focuses his practice on patent post-issuance proceedings, U.S. and international patent procurement, and intellectual property litigation and counseling. He has represented clients in well over 40 inter partes review (IPR) and covered business methods proceedings, including taking and defending expert depositions and presenting oral argument in numerous IPR proceedings. Paul also has substantial experience in both asserting and defending against patent and trademark infringement claims in the federal courts, while remaining active in procuring and managing international IP portfolios. Clients benefit from Paul’s broad technical background and experience. Prior to joining Fitch Even, he was a project engineer for an original equipment manufacturer in the printing industry. There he was responsible for designing, developing, and testing a diverse line of automated process control equipment. As an undergraduate at the University of Illinois, Paul’s studies focused on mechanical and electrical engineering, controls, and programming. He was awarded a one-year grant to study mechanical engineering at the Technische Universität München in Munich, Germany. Paul is conversationally fluent in German. Google Inc. and Apple Inc. v. ContentGuard Holdings, Inc. (PTAB 2015). Integral member of team representing ContentGuard in 35 IPR and CBM proceedings filed against its digital rights management patent portfolio. Five proceedings dismissed voluntarily. After submission of patent owner preliminary responses, obtained PTAB decisions denying institution of trial in all but one remaining proceeding. Epic Provisions v. Luchi LLC (W.D. Tex. 2015). Represented Luchi in defense of its trademark rights. Case settled favorably for Luchi to maintain its trademark rights and control of the vegetarian protein supplement market. TK Holdings Inc. v. CTS Corporation and CTS Automotive Products (E.D. Mich. 2008-14). Member of litigation team defending claims of infringement under patents relating to automotive seat weight sensors. Obtained summary judgment rulings that our client’s sensors do not infringe and that the asserted patents are invalid for multiple reasons. McDavid Knee Guard, Inc. et al. v. Adidas Sales, Inc. (N.D. Ill. 2009). Member of litigation team representing plaintiff in a patent infringement action related to protective apparel. Settlement reached. McDavid Knee Guard, Inc. et al. v. Nike USA, Inc. (N.D. Ill. 2008-14). Member of litigation team representing plaintiff in a patent infringement action related to protective apparel. Settlement reached. “Immunity for Sale? Tribal and State Sovereign Immunity at the PTAB,” Fitch Even Webinar, Co-Presenter, February 22, 2018. “Reasonable Error Correction or Death Squads—Is the PTAB’s Invalidation Rate Too High or Just Right?,” Moderator, Chicago-Kent College of Law, October 20, 2017. “Inter Partes Review Tips and Considerations for Practitioners,” Fitch Even, Washington, D.C., October 28, 2015. "Joint Infringement and Indefiniteness After Limelight and Nautilus," Fitch Even Webinar, with Eric L. Broxterman, June 26, 2014. "Patent Law Primer Post-AIA: Do We Still Need to Keep Lab Notebooks?," Fitch Even Webinar, November 21, 2013. "Practical Considerations for U.S. Patent Practice After the America Invents Act," Grünecker, Kinkeldey, Stockmair & Schwanhäusser, Munich, Germany, October 8, 2013. "How Far Do You Have to Look Under the Rock? To What Extent Is There a Duty to Investigate Potentially Invalidating Prior Art?," with Karl R. Fink and Joseph F. Marinelli, AIPLA 2009 Annual Meeting, Washington, D.C., October 15, 2009.